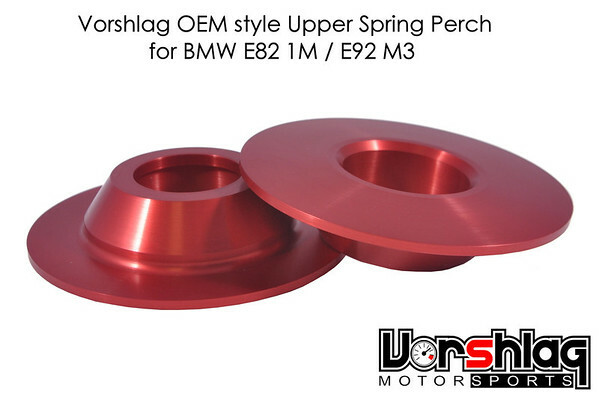 Prototype OEM style upper perches for our E92 M3 & 1M camber plates. Great! Any ETA on a final product release? Most likely will be added to our catalog in late-July or early August assuming everything fits as we designed it to. We will be fitting the prototypes next week. Prototype perches are back from the platers and we have a set built up to go on our first 1M tester later this week. After we verify the install on that car I'll contact the local guys on my list for the second spot. We went with red. Seems to be our color. At crazy angles they still have clearance between the unmolested bolt head and perch and they have the same perch height as the OEM perches. Here's the perch with the OEM rubber isolator on it. Shame to cover up all that red aluminum. Way to go guys. My vorshlag camber plates are holding up great with over 2 years of abuse. 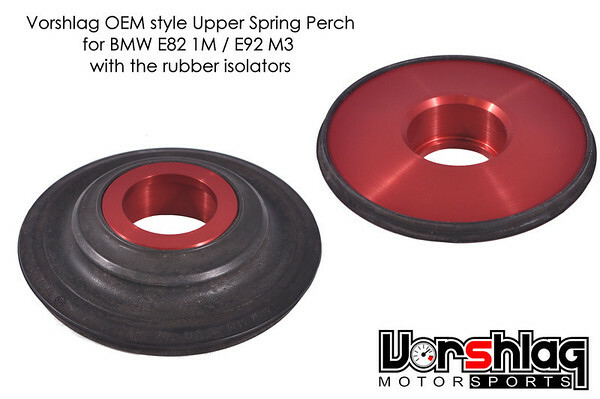 To be clear, can these upper perches and Vorschlag plates be used with OEM EDC shocks? If so, Harold please PM me a price if you have one yet. Thanks. More details to come. These are still in the R&D stage. Are these modular in the sense that they can later be converted to work with a different coilover/damper, like Motion Control Suspension? I think that would be the case with these as well, just like the none M versions. More details will be posted later. Thanks, can't wait for the final version. So these plates will be like the E46 plates? About 1/4" of toe swing from min to max camber? Yes. They are fully modular. 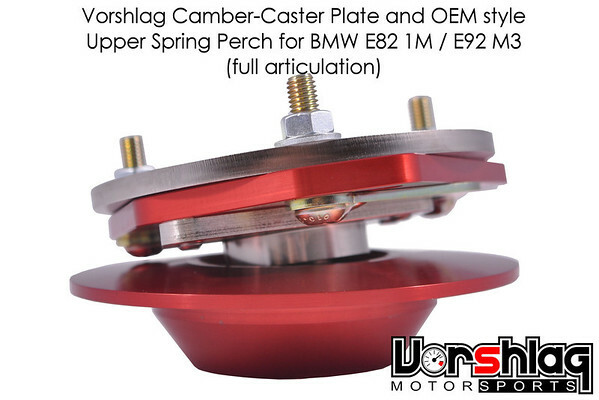 With a change of spring perch and adapter spools they can fit almost any aftermarket strut. 60mm and 2.5" perches and spools cost $75 or $100 per pair depending on the need for extended top nuts. Exactly. Makes it easy to set them for 2 degrees and zero toe on the street and 3.5 degrees with a 1/4" toe out for competition. Hopefully I can sell my GC plates once these come out. What don't you like about the GC plates? A lot of people have seen failures with the GC plates. I had to spend more money to fix the bolt plate...which had 0 miles on it. 1/2" total toe out (1/4" each side) seems like a lot to me. That is. But moving the plates from a "street" setting to a "competition" setting typically nets a TOTAL of 1/4" toe out. TOTAL is what commonly used when referencing toe settings.